We called. We wrote. We conquered. In February 2003, a motley group of thirty-five beer lovers gathered at the All About Beer office to discuss one issue: how to lift North Carolina’s 6% alcohol by volume cap on beer. For seventy years, North Carolina had imposed a 6% ABV restriction on beer sold and brewed within the state. Only four other states -- West Virginia, South Carolina, Alabama, and Mississippi -- had such a severe restriction. The thirty-five of us (beer geeks, homebrewers, industry professionals) were fed up. This relic of Prohibition made it illegal to brew or sell one-third of the world’s beer styles, including Belgian ales, hoppy IPAs, and intensely malty dopplebocks. Beers meant for sipping and savoring…nothing like the American light lagers that dominated North Carolina’s store shelves. For two-and-a-half years, this group of thirty-five no-nothings (yes, yours truly included!) grew into a grassroots movement of thousands of North Carolinians. We hired a lobbyist, the amazing Theresa Kostrzewa. In our first legislative push, the Pop The Cap bill passed two House committees, two Senate committees, the House floor, and the Senate floor. Such progress is almost unheard of, especially with such a potentially volatile issue as raising an alcohol cap. We overcame intense resistance from old-line distributors, neo-Prohibitionist interest groups, and some amazing political theater. 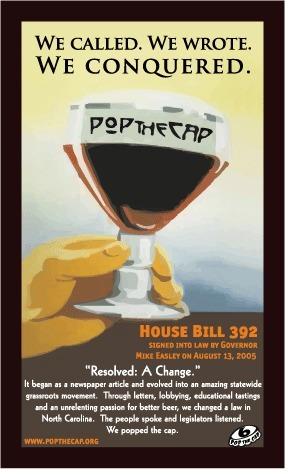 August 13, 2005: Governor Mike Easley signs House Bill 392 into law, lifting the 6% cap to a more-reasonable 15%. When I helped found and lead Pop The Cap, I never thought I'd start up a brewery. I just wanted to buy good beer at my local bottle shop. But the opportunity to work with fine people making fine beverages is a dream come true -- one that slowly unfolded for me in the late 2000s, after the lifting of the 6% cap. In that way, my story isn't that unique: in 2005, North Carolina was home to around two dozen breweries. Now we're at more than two hundred. We estimated the cap would create 300 new jobs. Let's just say our numbers were a bit off. A few dozen of those jobs are the fine folks at Fullsteam, all of whom receive (at a minimum) the Durham Living Wage. Today's thriving beer scene makes it feel like the 6% cap never really happened. A relic of a bygone era. And that's just the way we wanted it. There's no nostalgia, other than a wistfulness for a time where people all across the political and social spectrum united around good beer and a good grassroots fight. Many thanks to the Wayback Machine for archiving the Internet.